The Ugly Stepsister was a fun and unique read. I really enjoyed it! I love a good fairy tale retelling, so I knew this would be a good book for me. What made The Ugly Stepsister so neat was that Ling veers from the classic fairy tale and creates a different story in Cinderella's world. Immediately, I liked that the story is told from Katriona's perspective, and not Cinderella's point of view. The other stepsister has never been really fleshed out as a character (the movie Ever After did the best job of it until now, in my opinion) so it was neat to read the story from a different perspective. And I liked Katriona right from the start. 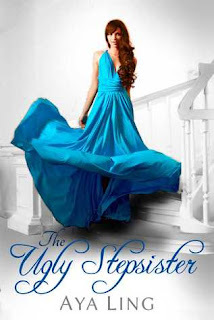 The fact that the book was magical and that Kat had to complete the story gave The Ugly Stepsister a sense of urgency. Kat desperately wants to get home, back to her family, and yet she must complete the story to do so. Much of the book is spent with Kat devising ways to get Elle and Edward to fall in love. It was funny and inspiring to watch her keep trying to do the impossible, moving forward with dogged determination. I admired Kat for being so focused and committed to her goal of getting home. But I also admired her commitment to making a difference in the story world while she was there. I usually don't comment on covers but I have to ask: what is going on with her skirt in this cover? Is it caught in a drift wind? It looks like the hoop part has flipped up on itself and is stuck. The dress is also not consistent with the corseted style the characters wear in the novel. I really loved everything about The Ugly Stepsister, right up until the ending. After so much build-up and anticipation, I wanted to see more of Kat's own happily ever after. I wish that the epilogue would have been longer, and maybe set in the future. Those two complaints aside, which were small in comparison to how much I liked this book, The Ugly Stepsister is a great read. I highly recommend it to fans of YA and especially fans of fairy tales.